In our house, the men (both little and not so little) are huge fans of superheroes. The release of Iron Man 3 earlier this month made an opening day trip to the movie theater. The movie was full of action, adventure and quite a few laughs. For my little Iron Man fans, the trip to the movies wasn't enough. Iron Man toys have become a must have in their world. Iron Man movies show that Tony Stark loves his toys and gadgets. The faster it goes, the farther it travels or the higher it soars, the better. 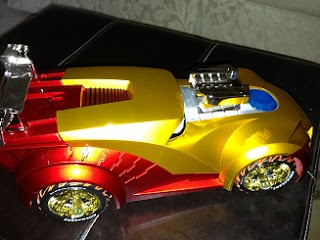 Kids can get into the Iron Man fun with their own RIDEMAKERZ customized car. RideMakerz offers a immersive building and customizing experience for the whole family. With over 649 million ways to customize your favorite toy car or "ride," this product lines unleashes creativity, encourages collaboration, fosters confidence and instills a sense of community. To celebrate the summer blockbuster, Iron Man 3, RIDEMAKERZ is offering the new addition to the line, Iron Man vehicle. The Iron Man vehicle is 1:18 scale, which is approximately the size of a football. In addition to the customizable features, guests can add a remote control option for $25. The special Iron Man vehicle is available for purchase online at RIDEMAKERZ website or at the following locations, Downtown Disney, Anaheim, CA; Downtown Disney, Lake Buena Vista, FL; Branson Landing, Branson, MO; Broadway at the Beach, Myrtle Beach, SC. The Iron Man vehicle retails for $38. A remote control option can be added for $25. It is recommended for ages 5 and up. Don't let the excited fall flat after you leave the theater. Create your own Iron Man adventures at home with the RIDEMAKERZ Iron Man vehicle. Your kids will be the super fans that everyone envies. That Iron Man vehicle is cool. I really like the remote control option. My grandson is getting to that age...maybe another year.. Wow!! What a great looking vehicle!! My son would LOVE this!! !